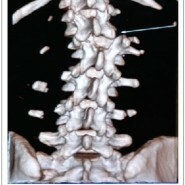 Unusual Cause of Irreducibilty of Traumatic Spine Fracture. Department of Orthopaedics, Saveetha Medical College Hospital, Thandalam, Chennai., India. Introduction: There is a scanty literature support describing the incidence, mechanism of lateral dislocations of thoracolumbar spine and its management describing the reduction techniques. Hereby we present an interesting case of extruded disc acting as buttonhole preventing the reduction of lateral dislocation of L1-L2 vertebrae and this would be the first of its variety to be described ever in literature. Case Report: A 30 year old female was referred to our hospital on post trauma day 7 with bilateral fascet fracture and lateral dislocation of L1-L2 vertebrae and fracture humerus on right arm following a road traffic accident. She presented with clinical signs consistent of cauda equina lesion. She underwent surgical reduction and TLIF L1-L2. On one year follow-up X-Rays showed maintenance of dorsolumbar saggital alignment without collapse. Conclusion: Dislocations of spine are three column injuries, are highly unstable requiring surgical stabilisation. 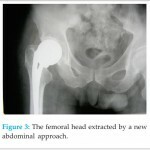 Posterior instrumentation is the routinely followed technique to achieve reduction and for posterolateral fusion. In this case lateral dislocation was reduced only after removal of the laterally extruded disc. After complete discectomy TLIF was considered a good option for restoring disc space height and maintaining saggital balance. 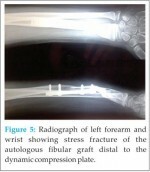 Keywords: Lateral dislocation of L1-L2, TLIF, extruded disc, posterior stabilization, posterior lateral fusion. Fracture dislocations of the thoracolumbar spine are often due to high velocity injuries. The injury to the posterior ligamentous complex, disc and fascets makes thoracolumbar fracture dislocation highly unstable, often associated with neurological injuries. They require surgery to realign the spine and instrumentation to stabilize the spine. The reduction techniques available are removal of fascets or by distraction. Hereby we present a case of extruded disc acting as buttonhole preventing the reduction of lateral dislocation of L1-L2 lumbar vertebrae and the way with which we overcame the situation. A 30 year old female was referred to our hospital on post trauma day 7 with bilateral fascet fracture of L1 and dislocation of L1-L2 vertebrae following a road traffic accident. She presented with clinical signs consistent of cauda equine lesion and Frankel grade C. she was assessed radiologically with CT scan and MRI. MRI scan showed gross stretching of dura(Fig-2) and lateral extrusion of L1-L2 disc on left side(Fig-3).CT scan showed lateral dislocation of L1 over L2,bilateral fascet fracture(Fig-4) and rotation of L1 vertebrae(Fig-5), Preoperative planning for placement of pedicle screws was made using CT scan pictures. 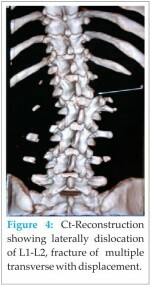 Thoracolumbar injury classification and severity score scale- 9she underwent surgical reduction and TLIF L1-L2(Fig-6). At three months follow up her Frankel grade improved to E. Surgical Technique: The Midline posterior approach extending from D11 to L4 spinous process was used. The interspinous ligaments, supraspinous ligaments and ligamentum flavum between L1-L2 were torn and the fractured fascets were mobile bilaterally, L1-L2 ligamentum flavum was removed to expose the dura. No dural leak was noticed. Using free hand technique Pedicle screws were placed in D12 and L3 on the right side, rod contoured to the deformity was connected to provide provisional stabilization. Pedicle screws placed on left pedicles of D12,L1,L2,L3 and rod contoured to the deformity connected to stabilize the spine. Remaining Pedicle screws for L1 and L2 was placed .The provisional rods were removed and rod contoured to normal dorsolumbar kyphosis were connected. Distraction was done to reduce the dislocation but in vain, moreover it was exaggerating the kyphotic deformity. On careful examination of the MRI we felt the disc would be acting as buttonhole preventing the reduction, so we went on with removal of right facet of L1and L2 to get access to L1-L2 disc space. Discectomy was done taking care to remove the entire disc. Once the extruded disc material was removed, to our surprise the correction of lateral displacement was achieved easily. The disc space was enlarged by distraction and end plates preparation done. Packing of bone graft in the anterior third of interdiscal space deferred as defect in anterior longitudinal ligament was noticed. TLIF titanium cage size 8mm packed with bone graft impacted into the disc space using TLIF cage introducer under c- arm guidance. Final tightening done under compression. Plating was done for her fracture humerus in the same sitting. Follow-up: The patient was made to sit from post-operative day 1 with Taylor’s brace and strengthening exercise of both lower limb started. Neurological assessment at the end of 3 months showed Frankel grade E. X-ray DL spine showed maintenance of reduction. At 1 year follow up neurological assessment showed full recovery and fusion of L1-L2. Thoraco lumbar fracture dislocations are high velocity injuries, commonly produced by road traffic accidents, associated with extremity fractures, chest injuries, head injuries and intraabdominal injuries. Thoracolumbar fracture dislocations are often associated with neurological injury more severe at upper levels than the lower spine. The neurological involvement at the level of L1-L2 can be conus medullaris or cauda equina injury. Cauda equina being a peripheral nerve lesion has better prognosis compared to the conus medullaris lesion. The involvement of posterior ligament complex injury signifies more severe neurological involvement but also good recovery chances.Thoracolumbar fracture dislocations are three column injuries and surgical intervention is often required to achieve stability of spine, decompress the neural structures and for early mobilization of the patient. Realignment of the spine itself decompresses the neural structures in fracture dislocations and anterior decompression is not usually required. Stabilization of the spine helps in early mobilization preventing complications of prolonged bedrest such as decubitous ulcer, deep vein thrombosis, chest infection. Most of the studies has shown, earlier the decompression better the neurological recovery[6,7].Bohlmann et al showed even in delayed decompression of spinal canal compression by thoracolumbar fractures, gave good recovery of neurological function. In our case report even though the surgery was done after 8 days of injury ,the neurological status recovered from frankel grade C to Frankel grade E at three months followup. Reduction techniques described for thoracolumbar dislocation is mainly for the anterior dislocation, the described techniques achieved reduction by removing the fascets or by distracting the fascets and realignment of fascets. In this case Lateral displacement persisted even after applying distraction by posterior instrumentation. Reduction was achieved only after removal of the extruded disc material. In our case report, the extruded disc material lateral to the spine is the main cause for preventing reduction, and its removal was necessary to restore the normal alignment. Kamil Melih Akay et al. reported a case of Fracture and lateral dislocation of T12-L1 without neurological deficit, got reduction with rods and poterolateral fusion was performed. The reduction techniques was not clearly described. Posterolateral fusion without anterior support will put lot of stress on the implant, many authors have reported high incidence of implant failure[9,10,11] and fracture of the transverse process with displacement reduces the area of fusion. In our case, complete discectomy was needed to achieve reduction, resulting in complete loss of disc space and increase in local kyphosis. Transforaminal lumbar interbody fusion has advantage of providing anterior support to the spinal column from posterior approach, providing large surface area for fusion and restoring height of disc space. Morel et al. described a case report of complete lateral dislocation of T12-L1 with complete neurological deficit, reduced by distracting the T12 -L1 followed with posterolateral fusion. The author stressed the importance of visualization of the dura during reduction process to prevent any further neurological injury. Some authors suggest interbody fusion if disc is damaged and reduced surface area for bone fusion due to posterior element fracture[13,14]. In one of the study TLIF achieved good saggital balance of thoracolumbar spine, large surface area for bone grafting in old fracture dislocation of thoracolumbar fracture dislocation. The point of extruded disc acting as buttonhole in a case of fracture and lateral dislocation of thoracolumbar spine should be considered as one of the hurdles in overcoming the reduction. Extruded disc in MRI should be considered significant. And we suggest in such situation complete discectomy with removal of the extruded disc helps in reducing dislocation and TLIF provides anterior support, large fusion area, restores height of the disc space and saggital balance. 1. Moore TA, Steinmetz MP, Anderson PA: Novel reduction technique for thoracolumbar fracture –dislocation. Technical note. J Neurosurg Spine. 2011 Dec;15(6):675-677. 2. Vaccaro AR, Lehman RA Jr, Hurlbert RJ, Anderson PA, Harris M, Hedlund R, et al: A new classification of thoracolumbar injuries: The importance of injury morphology, the integrity of the posterior ligamentous complex, and neurological status. Spine (Phila Pa 1976). 2005 Oct 15;30(20):2325-2333 . 3. Bohlmann HH: Treatment of fractures and dislocations of the thoracic and lumbar spine. J Bone Joint Surg Am. 1985 Jan;67(1):165-169. 4. Kim NH, Lee HM, Chun IM: Neurologic injury and recovery in patients with burst fracture of the thoracolumbar spine. Spine(Phila Pa 1976).1999 Feb 1;24(3):290-294. 5. Eskenazi MS, Bendo JA, Spivak JM. Thoracolumbar spine trauma: Evaluation and management. Curr opin Orthop. 2000; 11: 176-185. 6. Gaebler C, Maier R, Kutscha-Lissberg F,et al: Results of the spinal cord decompression and thoracolumbar pedicle stabilisation in relation to the time of operation. Spinal Cord. 1999 Jan;37(1):33-39. 7. Mc Lain RF, Benson DR: Urgent stabilisation of spinal fractures in polytrauma patients. Spine(Phila Pa 1976). 1999 Aug 15;24(16):1646-1654. 8. Akay KM, Baysefer A, Kayali H, Beduk A, Timurkaynak E. Fracture and lateral dislocation of the T12-L1 vertebrae without neurological deficit–case report. Neurol Med Chir (Tokyo). 2003 May;43(5):267-70. 9. Carl AL, Tromashauser SG, Roger DL. Pedicle screw instrumentation for thoracolumbar burst fractures and fracture dislocation. Spine(Phila Pa 1976).1992 Aug;17(8 Suppl):S317-24. 10. Graziano PG, Cotrel-Dubousset hook and screw combination for spine fractures. J Spinal Disord. 1993 Oct;6(5):380-5. 12. Mummaneni PV, Haid RW, Rodts GE. Lumbar interbody fusion state-of-the-art technical advances. Invited submission from the joint section meeting on disorders of spine and peripheral nerves, March 2004. J Neurosurg Spine. 2004 Jul;1(1): 24-30. 13. Vialle, Raphael MD, Court, Charles MD, Traumatic lateral lumbosacral dislocation: One case and review of literature. J Spinal Disord Tech. 2005 Jun;18(3):286-289. 14. Xiangqian Fang, Shunwu fan, Xing Zhao: Application of transforaminal lumbar interbody fusion in old thoracolumbar fracture and dislocation. J spinal Cord Med. 2011 Nov; 34(6):612-615.